*This post may contain affiliate links. There is no extra cost to you, but we could earn money that will greatly help our family. Please see our disclosure for further information. In our family, the only morning person is my dad. The rest of us are NOT morning people. Mornings can be really hard in our family as we would rather stay up late then get up early. Are you a morning person or a night owl? We get it, life is busy and we all have busy schedules and it can feel like mornings are super rushed to get out the door. The last thing you need in your life is to be late to work or to school. 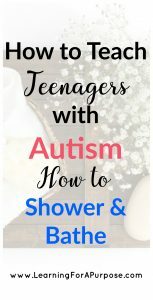 I wanted to share some time saving tips that myself and our family has been using to help our entire family have an easier morning, but we also wanted to share tips to help your teenager with autism also have an easier morning as well. Set out your clothes the night before. We just use a table in my brothers room to lay his clothes on the night before so in the morning he can quickly grab and change his clothes. I have seen other examples of this where they even set out clothes for an entire week where they use a collapsable shelf that hangs in the closet where they have a shelf for each day of the week. Prepare meals the night before for breakfast and lunch if needed. In our family we bring our lunches to work and this is a HUGE time saver! If it is already packed and ready in the fridge all you have to do is grab and go! You can do the same for breakfast as well if you are needing to eat on the go or even quickly at home. Some on the go breakfast or lunch items that we take are cheese sticks, yogurt, granola bars, and bananas. Set your alarm 5 minutes sooner than when you need to get up for the day. I know this may not seem like a lot of time, but 5 minutes can be the difference between being late or on time to where you need to go. What if traffic is a little slower or you spill something and you need to quickly change. There can be so many what if’s in the morning that it is always a good idea to give yourself a 5 minute buffer. Do not check your email or social media accounts when you first wake up. I know it can be soooo tempting to take a peek at your emails or what is going on with Facebook when you first wake up, especially if you use your phone as an alarm, but this can take up valuable morning time that you don’t already have. We can get lost in time trap of just scrolling and lose track of time. Instead I would recommend doing some morning stretches in bed, drinking a glass of water, or using an app where you can read a short prayer or affirmation for the day so you can start your day on a positive note. If you really want to help yourself get up in the morning you can set up your alarm across the room, so that when it goes off you will have to physically get out of bed to turn off the alarm. Maybe start your day off with eating breakfast first. I know there are many times when I skip breakfast because I ran out of time and then I am starving by the time lunch or mid morning hits. If you are more motivated by food, maybe try changing up your routine and start with breakfast first during your day. Try to use a checklist to help you remember each step of your morning routine and so that you don’t forget something that you needed to take to school or to work. This can be especially helpful if you are trying to teach your child/teenager how to be more responsible for themselves in the morning and save mom some time in the morning with allowing the kids to be more independently. Place the checklist in a location the child/teenager will see it either in the bedroom or the bathroom or both locations. We have a created a FREE CHECKLIST for you to use for your morning routine that you can try to customize to fit your lifestyle and routine. Download your FREE Morning Checklist below by providing your name and email! Our last tip is to find an alarm sound that can wake you up so you don’t sleep through the alarm. You may need to change the alarm sound up every so often so that your body doesn’t get used to the same sound over and over every morning. 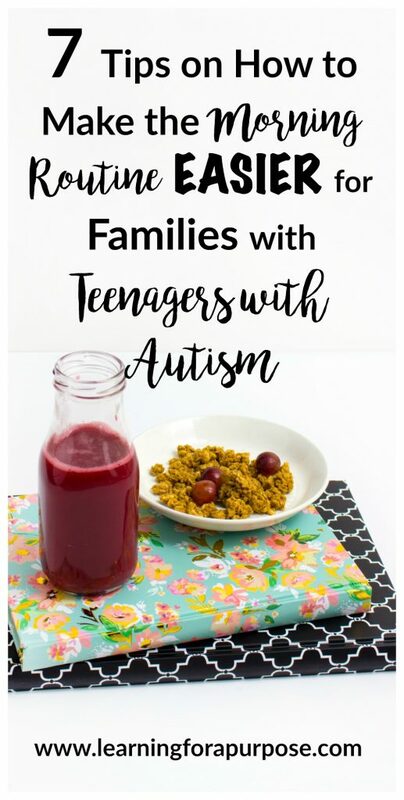 Our family really dislikes mornings, but we hope with the help of these strategies together we can start to like mornings a little bit more 🙂 We hope you can find these tips helpful for your morning routine as a family and specifically to help give more responsibility to your teenager or child with Autism. Try out the checklist and we left some space for you to add in your own that are specific to your routine. We would love to hear if you have any additional suggestions or strategies that have helped make your morning routine easier. Is your family looking for additional autism support? 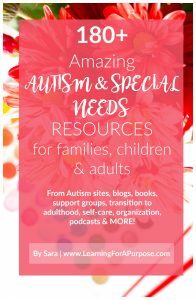 Check out our FREE Autism Resources guide with over 180+ Resources to help you and your family!! Download the Resources below!! Does your child have difficulty learning personal hygiene self care skills? 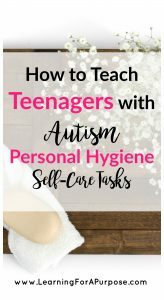 Check out our Ebook Everyday Life Skills Personal Hygiene Skills in the Bathroom for TONS of tips and resources to help your loved one become more independent with these skills! 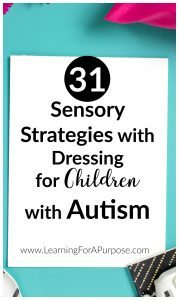 This post was part of a monthly series by other Special Needs Bloggers where we all shared tips on Time Management! Check out their amazing resources below for further ways to help make life a little easier!